As told through a mix of comics, doodles, and journal entries, it’s Victor Starspeeder’s third year at Jedi Academy! It’s also his first year EVER without his sister, Christina. Plus, things at Jedi Academy are… weird. After last year’s security breach, Principal Marr has been demoted and replaced with Commander ZC-04, a big, scary droid. There’s a curfew, new regulations, and everyone is on edge. But when Victor and his friends dig a little deeper into the changes at the school, they find that there’s a lot more to this story than the droids want to admit! 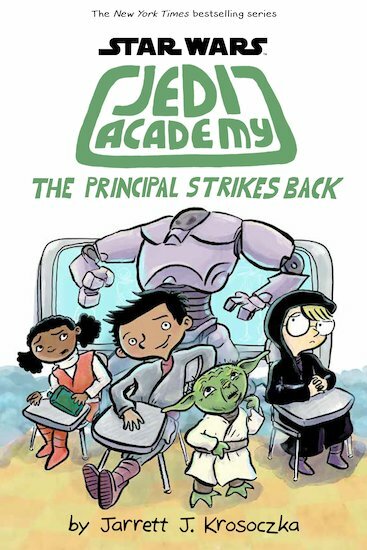 It’s an all-new, out-of-this-world Jedi Academy adventure as The Principal Strikes Back!